(Bloomberg) -- A Hong Kong court found democracy activist Benny Tai guilty for his role in organizing the Occupy protests, the latest step in the China-backed government’s effort to punish leaders of demonstrations that rocked the former British colony almost five years ago. Tai, an associate law professor at the University of Hong Kong, was found guilty of conspiracy to commit public nuisance and incitement to commit public nuisance by District Court Judge Johnny Chan on Tuesday in West Kowloon. He was among nine academics, activists and politicians convicted of charges related to their roles in organizing mass rallies that lasted 79 days. Chan didn’t indicate when any sentences would be handed down, but said the court would reconvene Wednesday. Tai and the movement’s two other main leaders -- Chan Kin-man, 60, a retired associate professor of sociology at the Chinese University of Hong Kong, and Reverend Chu Yiu-ming, 75 -- were met with loud applause from spectators chanting “Civil disobedience!” and “We want universal suffrage!” as they exited the courthouse Tuesday. The three men were convicted of conspiracy to commit public nuisance for their roles in the protest. Other defendants were found guilty of charges including incitement to commit public nuisance. 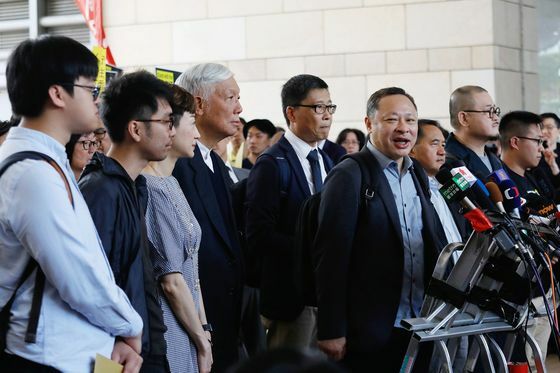 The trial caps Hong Kong’s effort to pursue those who encouraged the demonstrations, which sought the open nomination of candidates for what was supposed to be the first direct election of the city’s leader. The protests focused the world’s attention on Chinese efforts to constrain the local democracy movement, especially after police took the unprecedented step of firing tear gas at mostly student demonstrators, who defended themselves with umbrellas. China’s Foreign Ministry said it supported the Hong Kong government in “punishing” the movement’s organizers. While Tai, 54, was a leading advocate for adopting Occupy Wall Street tactics and shutting down the city’s financial center, the first demonstrations were kicked off by high school and university students. Leaders of the student groups, including Joshua Wong and Nathan Law, were sentenced to up to eight months in jail in 2017 for storming a government compound and triggering what also became known as the “Umbrella Movement.” An earlier sentence of community service was overturned by a higher court after being deemed too light. The government arrested more than 1,000 people during and after the sit-ins, which ended without securing any pledges to amend the Chinese government’s framework for the 2017 chief executive’s election. Instead, Chief Executive Carrie Lam was selected -- like her predecessors -- by a 1,200-member election committee stacked with Beijing loyalists. The so-called “Umbrella Nine” on Tuesday faced counts of conspiracy to commit public nuisance, incitement to commit public nuisance and incitement to incite public nuisance, three colonial-era criminal provisions. All had pleaded not guilty. The ruling Communist Party has since stepped up efforts to rein in what its leader views as some of the more radical element of Hong Kong’s pro-democracy camp, including a small independence movement that gained momentum in the aftermath of Occupy. China pledged to maintain the city’s free speech protections, independent judiciary and capitalist financial system before regaining it from the U.K. in 1997.